The Nikon D610 Digital SLR is designed for serious enthusiast photographers and sits above the D600 in the Nikon FX range. The Nikon D610 offers many features including the EXPEED 3 image processing engine, a 24.3-megapixel sensor, advanced video controls, an extendable ISO range of 50-25,600, a 39-point AF system with 9-cross types, time-lapse shooting, and dual SD-card slots. 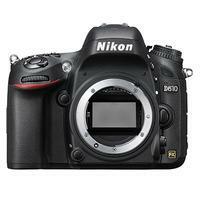 Nikon D610 24.3 MP Digital SLR Camera - Black (Body Only) NEW, BOXED!